JACKIE LOMAX was the lead vocalist and bass player in The UNDERTAKERS the rockingest, stompingest Mersey beat band of them all from the 60’s. The band moved to USA in 1965 and then changed their name to LOMAX ALLIANCE. In 1966, BRIAN EPSTEIN came to New York with The BEATLES and offered to manage Jackie as a solo artist but after Epstein’s untimely death a planned album was never released instead Jackie was signed as the first artist to The Beatles Apple label. The rest is history. This release compiles tracks across Jackie’s 47 year career before his untimely death in 2013. A 2CD set that brings together unreleased tracks, rare tracks and Jackie’s favourite live concert from 1976 as well as a German language version of “How The Web Was Woven”. These discs present no less than thirty-eight (!) cuts that shed light on what a varied and intriguing catalogue of music this man produced. Jackie is sadly no longer with us (he passed away in 2013). But thanks to the fine folks at Angel Air this collection will help his memory live on forever. Totally groovy tracks include "Soul Light," "Give Your Heart To Somebody," "Throw Your Love Away," and "She Took Me Higher." Lomax may not have much name recognition, but that's not for a lack of quality, and Rare, Unreleased, and Live shows that Lomax is a man whose catalogue is worth exploring. This 2 CD set reveals a true artist and composer well respected by his famous peers. He could handle it all. Here you can go back to The Undertakers with Throw Your Love Away, cross the pond to experience the driving, big-band soul of Soul Light, Who's Foolin' Who and Against All Odds, and there's a live San Francisco concert from 1975. We lost Jackie when he passed away in 2013 back where he'd started, The Wirral, Cheshire. But his 69 years were filled with creative achievement. He's sadly missed. ...he remains interesting as a recording artist. This CD retains such interest but is aimed at Lomax fans as it contains a host of rarities, largely from 1965-1970 including solo work, from Heavy Jelly, that Bee Gees cover, a German version of How The Web Was Woven and The Lomax Alliance plus a 1976 live concert from San Francisco. 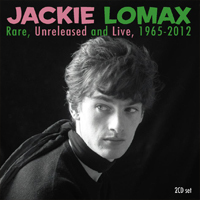 For the Lomax fan, this collection is a 'must buy'. This splendid anthology of the vocalist's work draws on hitherto unreleased recordings made between 1965 and Jackie's untimely death in 2012, including the mellow Merseysider's favourite concert, a particularly appealing live set which was captured for posterity at the Savoy in San Francisco in December 1976. This release compiles tracks across Jackie's 47 year career before his untimely death in 2013. A double CD set that brings together unreleased tracks, rare tracks and a live concert from 1976 at the Savoy in San Francisco. It's a collection of the late singer's gems from his time with the Scouse also-rans THE UNDERTAKERS up to the songs he worked on in the last year of his life, with the pride of place given to Jackie's American concert from 1976. A real treat.